MAKE forecasts the future of turbine technology. Onshore wind turbine size and capacity is on track to continue increasing at a steady pace, while offshore equipment will grow in leaps and bounds in the coming years, according to a recent note from MAKE Consulting on the future of wind turbine technologies. Offshore, 6-megawatt turbines are now giving way to 7 megawatts. But Barla said next-generation turbines will fall between 12 and 15 megawatts with rotors at 200 to 260 meters. “That’s an unprecedented size,” he said. GE has already announced its 12-megawatt Haliade-X. Top manufacturers like Siemens Gamesa and Vestas will likely follow. At the same time, Barla said, “product lifecycles are getting shorter," with bigger machines coming into the market more quickly. But how fast turbines grow will depend heavily on regional markets. In the U.S. that means 2-megawatt and 3-megawatt machines will remain the norm in onshore projects up through 2020, each accounting for a quarter of new product introductions through 2022. With the Production Tax Credit phasedown, manufacturers will move toward 4-megawatt turbines to improve project economics. 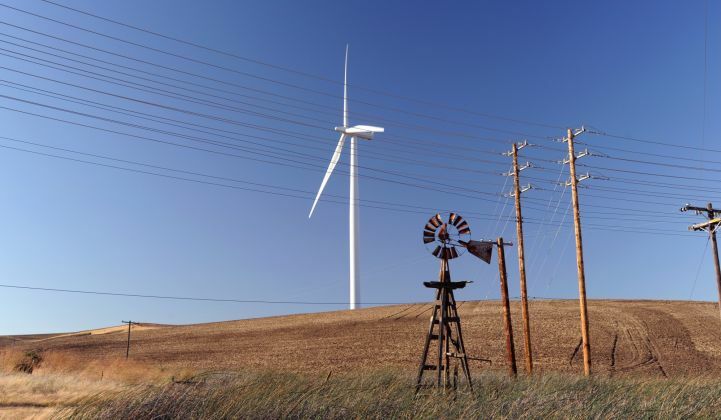 Europe’s market already favors slightly larger turbines because of land constraints. But the region will also experience the transition toward higher-megawatt turbines as incentives end and auctions for merchant market power-purchase agreements favor larger equipment with lower levelized costs of energy. “You’re not competing with subsidies anymore,” said Barla. Uptake of higher-capacity turbines will be more delayed in countries such as China and India in the APAC market. Barla said auctions this year in China will push it toward 3-megawatt turbines with large rotors, while India will transition in the next three to four years. The APAC market will actually be the largest in capacity, with 186.1 gigawatts. But through the end of 2023, MAKE expects 2-megawatt turbines to dominate. Europe altogether will have the greatest reliance on large turbines with 3-megawatt and 4-megawatt models making up nearly 100 percent of the market by the end of 2023. MAKE forecasts that the EMEARC market, which includes Europe and its advanced wind market, will be the only location where 5-megawatt turbines have a noticeable impact, accounting for 38 percent of new products through 2022. In the offshore segment, U.S. demand is picking up, but technology innovation in Europe will drive development in that market as well as in Asia and the Pacific. Europe's more mature market is seeing faster development of turbines that cross the 6- and 8-megawatt threshold — and even topping 10 megawatts past 2020. Siemens Gamesa, Vestas, and GE will all continue to build 2-megawatt machines for use in the U.S. and India. 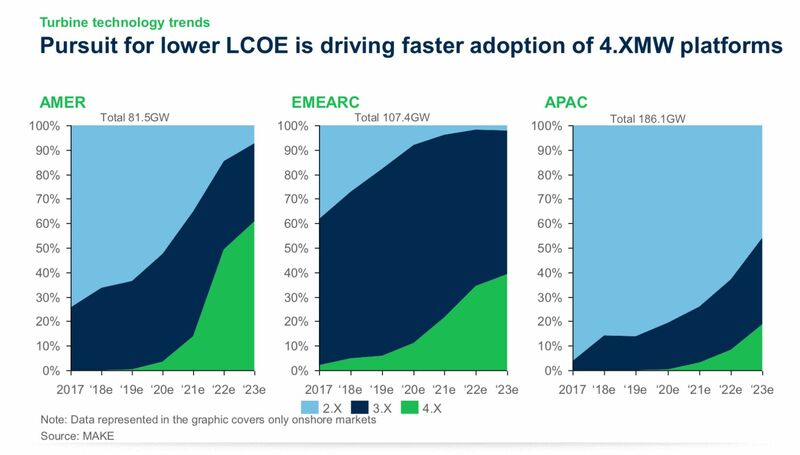 MAKE notes that Vestas will increase its production and expand its supply chain of 3-megawatt and 4-megawatt turbines in time with the longer PTC cycle in the U.S. and to get the edge on post-2020 growth.